WCA is the world’s largest and most powerful network of independent freight forwarders, with over 7166 member offices in 191 countries around the world. 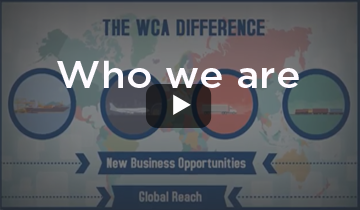 Dedicated entirely to providing world-beating benefits and networking opportunities to its members, WCA employs a full time staff of over 155 personnel based in eight member service and support offices around the world. Founded in 1998 by President David Yokeum as the world’s first worldwide non-exclusive network, WCA is neutrally managed and operated to truly benefit every member company. Over the past 20 years WCA has continuously strived to add new, innovative and high-value membership benefits and it is this unique formula, combined with a dedication to excellence, that has enabled WCA to set new standards in the industry. WCA has grown rapidly to encompass a range of networks and specialised services and each of the networks has flourished, with the help of annual networking conferences where members come together to meet and increase their business. Every member of every WCA network is also automatically covered by the most generous and extensive financial protection programme in the industry that allows your company to conduct business with other WCA members with complete security and peace of mind. Often imitated but never replicated, WCA remains the true innovator in the logistics networking industry and, by listening to our members, we are dedicated to continue to develop industry-leading solutions to the challenges and opportunities faced by the worlds best independent freight forwarders.